BTA 6-metre telescope in its dome. 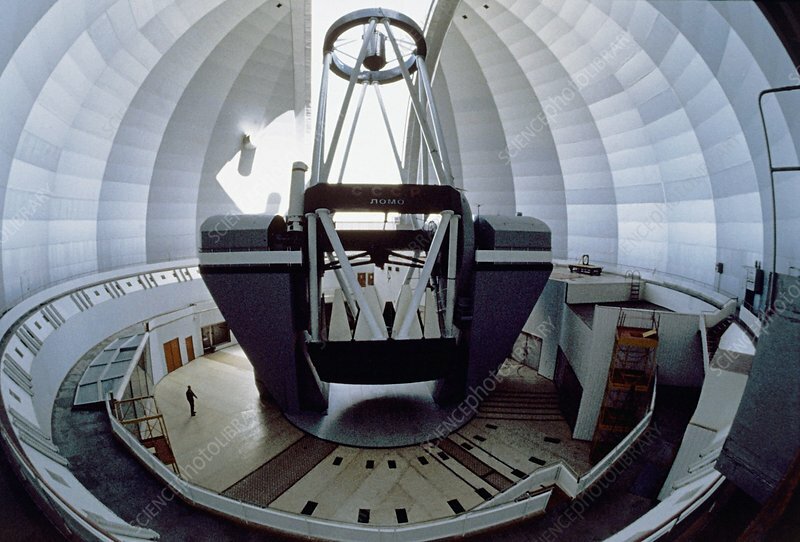 This optical telescope (the BTA-6, Bolshoi Teleskop Azimutalnyi, or Large Altazimuth Telescope) has an altazimuth mount and a six-metre primary mirror, making it the world's largest optical telescope from its completion in 1975 until 1993. It is located at an altitude of 2070 metres on Mount Pastukhov in the Caucasus, near the village of Zelenchukskaya in the Stavropol region of Russia. Staff live in the nearby scientific enclave of Nizhny Arkhyz. It is an observatory of the Special Astrophysical Observatory group of the Russian Academy of Sciences. Photographed in 1992.